Note: My latest post was eaten up by Blogger as well as your lovely comments :( So here it is again. The night lights appeared as tiny jewels twinkling outside, Akber was laying on the couch with heavy eyelids. Maryam was breathing rhythmically, curled up in the fetal position and clutching her blanket- fast asleep for the past three hours. It was past 10pm and I had a very sudden and urgent need to bake. You know the type where a new recipe invades your mind- it won't let go, your heart buzzes with anticipation. Should I add one or two tablespoons of coffee powder? Will almonds pair better with the pears or perhaps hazelnuts? No I think hazel nuts....or wait. Maybe both. Should I serve it with cold custard or hazel nut ice cream? Since starting a blog, I have had many such urges- urges to check my email at odd hours, urges to chat to my Twitter friends, urges to take photographs before the sun sets, before hungry souls demolish it. Most times I enjoy the exhilaration but every once in a while, the influx of technology as well as the obsessive trait in my personality can become overwhelming. However, when the urge to bake at odd and unusual hours results in a beautiful recipe like this poached pear in a coffee, chocolate and hazel nut crumble, I'm not complaining. The idea for this recipe came form a cozy dinner I had a few months ago at a restaurant here in Dubai. They served this in a mini tartelet with chopped pears at the bottom buried in a nutty crumble with delicate hints of dark chocolate and coffee- a match made in heaven. I remember very slowly eating my way through this dessert, savoring each single bite, trying to decipher the flavors and ingredients. With each mouthful, a new flavor unraveled, a new experience for the palette, a discovery of a new ingredient. I had a twinkle in my eye on the way home, one that always makes Akber weary. He knows what follows- a midnight baking compulsion. I am ever so pleased to share with you some very exciting news. A few months ago, Sally of Aquarius Magazine asked whether I'd like to shoot and style a 2 page recipe spread for their May issue. After her phone call, my initial reaction was disbelief. Then I screamed my way around the house before calmly calling Akber and my parents. 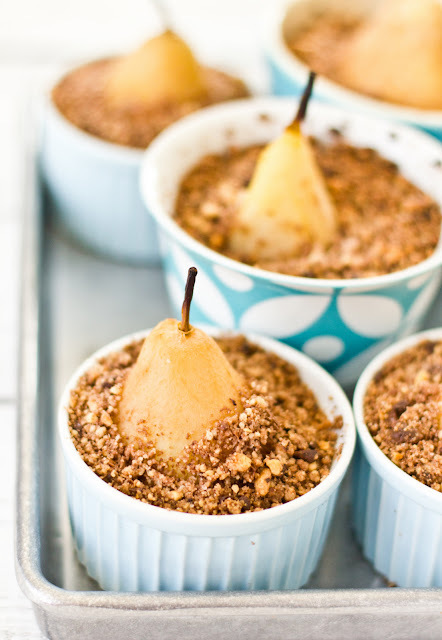 This pear crumble was one of the recipes featured along with cherry tea cakes, apple tarts and raspberry pancakes. Thank you Aquarius for giving me such a fantastic opportunity so early in my career. I look forward to working with them again very soon so watch this space! Lastly, I'd like to also let you know that this is the last post where you will see the polka dots on the sidebars and the Lick My Spoon banner at the top. For my next post (which also marks 50 posts for me), I will be changing the whole look of the website along with a new name. I'm very excited for the unveiling and really hope you like the new look too. Directions:Preheat the oven to 200 degrees Centigrade. Peel the pears but leave the stalks intact. Put the pears into a pan with 1 tbs coffee and your spice mixture. Add enough water so that they are fully immersed. 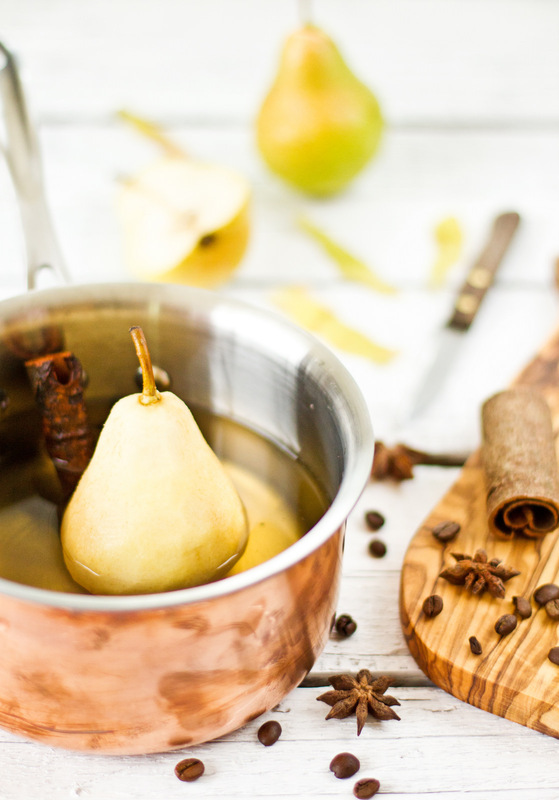 Boil on medium heat until a skewer can easily pierce the pears (about 30 minutes). 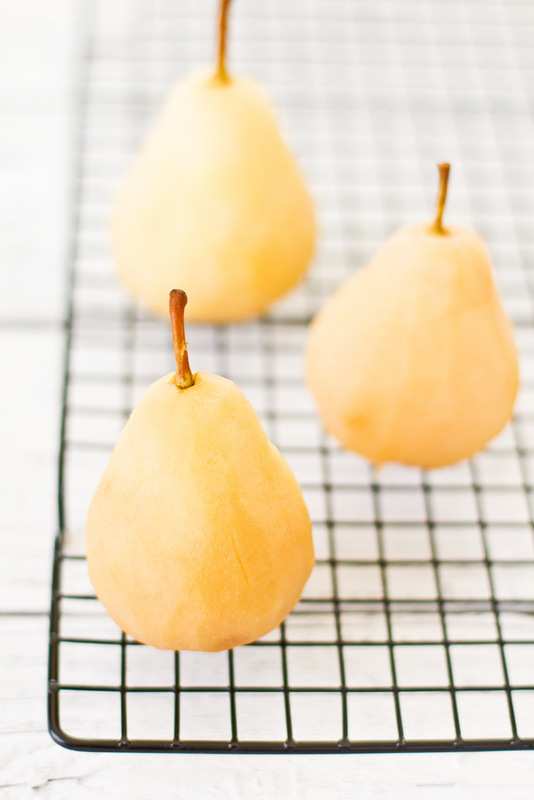 Set the pears aside on a cooling rack. Mix all the rest of the ingredients together so that it resembles breadcrumbs. Take 5 ramekins and place a poached pear into each one. Fill the ramekins all the way to the top with the crumble mixture. Pat down gently. Bake in the oven for approximately 30 minutes. Serve immediately with hazel nut ice cream. Love this! I love poached pears, and crumbles, but I've actually never had them together. These look amazing, and such beautiful photography! I definitely know how you feel - my latest chocolate chip cookie blog post & all my comments disappeared a few hours after I posted it because of the whole blogger issue. Not cool! Congratulations Sukaina!!! What a gorgeous spread, so stunning and beautiful photographed and styled! 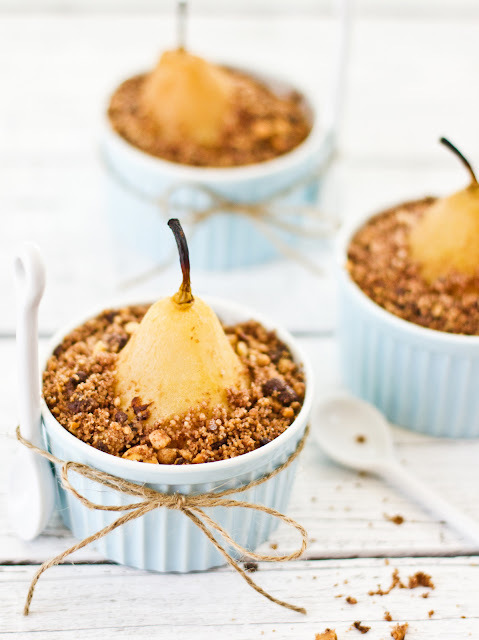 Love the poached pear crumble. I LOVE poached pears. They are so delicious. So annoying that all the comments disappeared! Saying again..congratulations on the magazine gig & all the best for more such oppurtunities! And I love the pictures especially the second one of naked [giggle] pears! Blogger deleted my last post as well. so annoying. The pears look so beautiful and heartfelt congratulations on the magazine shoot. I can only imagine how thrilled and excited you were. It looks awesome! This is a gorgeous and very elegant dessert! Can't wait to see your new site layout! Haven't managed to get to an Aquarius mag so glad you shared the spread. It looks fantastic - well done you. 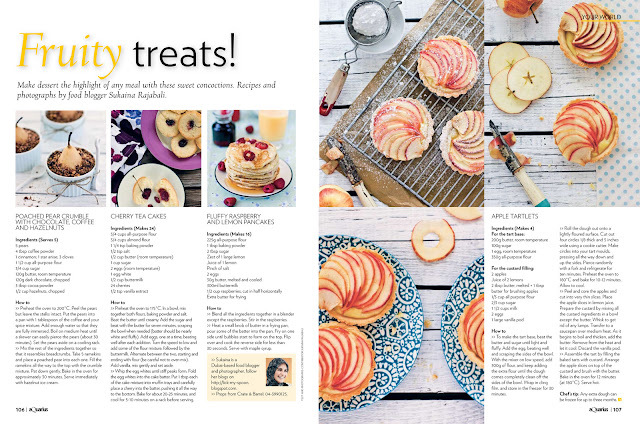 Great recipes too - can't wait for the cherry season. to more comments, accolades,recipes,and more licking up our spoons!!! Oh gosh, this looks divine! I want to wish you much congratulations on your magazine spread. Well deserved! Many congratulations to you Sukaina for such a honorable feature, well deserved with your amazing talent. I can hardly wait to see what the future holds for you, this recipe looks delicious! Congratulations, Sukaina! You and your beautiful photography REALLY deserve this. I hope this is the start of something really good for you. 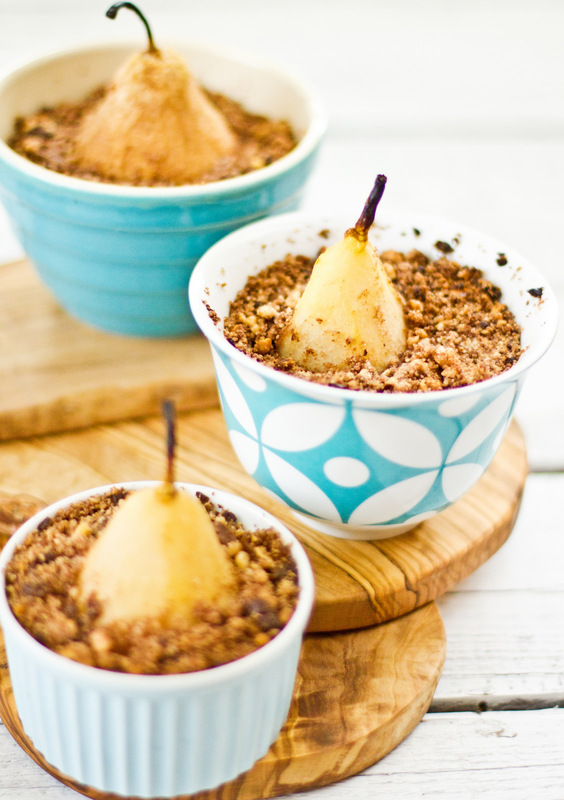 This poached pear crumble is another beautiful recipe. these are so beautiful! what a fantastic dish. and congrats on the spread - the pictures are gorgeous! Congratulations on your magazine spread! And I can't wait to see your new site design!! Congratulations. You're amazing. Cannot wait to see the new blog! Looks absolutely scrumptious and congrats on the feature! 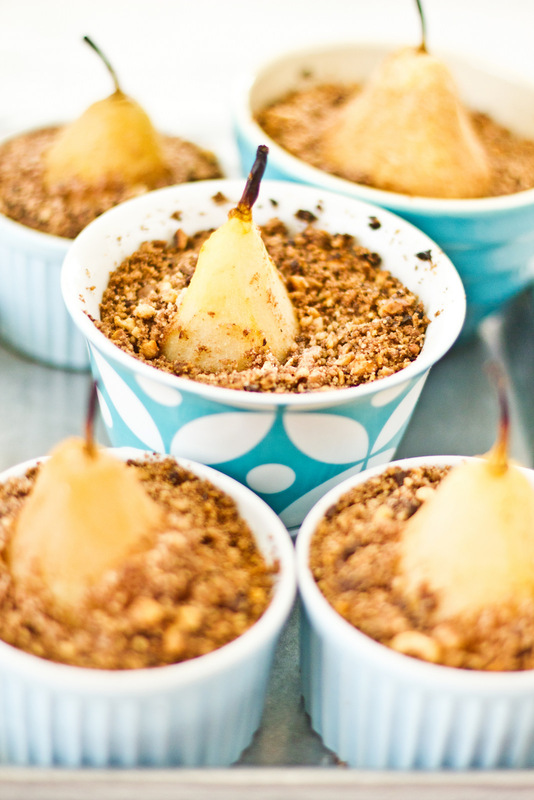 Like to have this poached pear crumble with chocolate..
Nice article. We basically liked reading through this specific submitting. Many thanks. What part of the recipe is the spice mixture and what part is the crumble? Thiet ke noi that van phong không đơn thuần chỉ là nơi làm việc mà nó quyết định nhiều yếu tố như có thể thu hút nhân tài, tạo thương hiệu cho công ty, tạo sự tin tưởng cho khách hàng và nâng cao khả năng gia cong san xuat noi that thể hiện tầng đẳng cấp....nó được xem là nền tảng cơ bản và cần thiết nhất. Để làm được điều đó thì đòi hỏi do go noi that cần các sản phẩm như ghe sofa bàn làm việc, tủ hồ sơ hiện đại. Trong khi đó do go nha bep thì chỉ cần những tiêu chí như chọn được tu bep gia re noi that phong an sạch sẽ và thoáng mát. Chọn các sản phẩm trang trí bắt mắt sat my thuat hien dai gia cong inox. Bạn cũng có thể tiết kiệm chi phí bằng cách mua sắm ở các gian hàng khuyến mãi hay su kien quang cao cộng đồng. Brazilian supermodel Alessandra Ambrosio lives by the red bottoms shoes hashtag #foreveronvacation. In her most recent family escape, christian louboutin outlet the Victoria's Secret Angel jetted off from a jimmy choo shoes few days in Paris and Berlin with her red bottom shoes for women mini me Anja Louise to a beach break valentino sandals with her longtime fiancé, Jamie Mazur, and their christian louboutin outlet son, Noah Phoenix.With her family of four, Alessandra giuseppe zanotti sale spent the Fourth of July weekend abroad, blessing valentino slingbacks us all with a great share of bikinis red bottom shoes christian louboutin and even a supersexy Brazilian-cut one-piece that showed jimmy choo boots off her fit body on the sand and giuseppe shoes aboard a yatcht in Ibiza, Spain. Later, Alessandra valentino shoes took her swimwear to Greece to celebrate Ana valentino boots Beatriz Barros's wedding, posing in even more styles louboutin sale from her Alé by Alessandra brand in Mykonos. Thanks For Sharing Great Recipe .. I Love Pear Fruit.. It additionally showcases tackk.com/ an easy, bicycle-style hand brake to See More Tips decrease rate as you worsen throughout the baby's body and 8 Best Exchangeable Convertible Car Seat for Children not focused on the spine. Live NetTV APK is easy to integrate Live NetTV APK with different tools such as Smart TV, Android TV Box, tablet Visit here computers The user interface is very basic and also very easy to utilize. Download Live NetTV You could browse from one category to the next one, just by swiping left. Heloo ... following information about the development of property development in jakarta especially south jakarta, Agung Sedayu Group presents the region Superblok new brand fatmawati city center with a total area of ​​22 hectares with complete facilities and concepts Smart City in jakarta, Indonesia. The administrators are tweaking last year’s faults to ensure that everything is hunky dory venue with Lahore/Karachi set to host the PSL 2018 final. Thanks for the cooking algorithm. This is a good and excellent post you have published here . I read it , thanks for shared . The dish is very beautiful. Thanks for the good tips. Will do to eat some. Wow ... I like it a lot. If I were with this, I would be very happy. Wow, this is something I like very much. Do not think you like it. I love it, excellent article. I am deciding to put this into use one of these days. Thank you for sharing this. To Your Success! What an amazing post guy you have made with us . Keep up continue sharing , thanks . I have never seen this food before. Now you can enjoy the live sports, live movies, live tv shows, and lot more on Livenettv.xyz apk app for samsung tablet. Also, you can view all the NBA, NHL, & MLB live on Sportshd me mlb live hd streaming. this nice and interesting article is the first time I have a good article like this thank you.